Angus Kennedy (see below) designed and supplied most of the pictures for this lovely website. He has recently created another beautiful website for the ACT Herpetological Association (ACTHA). They now have a wonderful news section that compiles all the herp-related news from the ACT region into one convenient place. Right now the top story is a crazy picture of a large eastern brown snake eating a slightly-less-large red-bellied black snake. Angus Kennedy. Thurlga Station, South Australia, 2012. Photo by me, probably. ACTHA is currently running Snakes Alive, a display of reptiles and amphibians at the Australian National Botanical Gardens. My two pet pythons are there, as are many critters from the ACT, around Australia, and even a few exotics! They also offer the opportunity to touch and hold some of the critters, should you so choose. If you're a herp nut in the ACT (or around the ACT, they accept Queabeyaners) you should consider joining to meet other reptile enthusiasts around here and listen to interesting talks on local herps, herp keeping, and herp research. Elephant with rainbow. Maasai Mara, Kenya, 2008. The main problem with this idea is I don't have many pictures. I own a decent camera, a Nikon D60, which is a digital SLR camera. I have three lenses for it, a 55-200, an 18-55, and a 2.8-32. I don't even know what those numbers mean, but I refer to the lenses as my telephoto, wide-angle, and macro lenses, respectively. I'm sure I could figure out what the numbers mean, it can't be too complicated, but to be honest I'm just not that interested. One thing I've learned about myself from owning an SLR camera is that I'm really not that into photography. Some people are artists with their photographs. I have great respect for these people, and I admire and appreciate their work. But I am not one of them. I take pictures primarily for the memories. I want that picture so that I can look back later and be nostalgic for that moment, remembering good times, great people, and interesting places. When I take lots of pictures of the same thing, it's more because it bugs me to have to look at a picture that's out of focus, rather than because I'm concerned about framing or getting the lighting right. Me with my first tuatara. New Zealand, 2004. In fact, over the six weeks I spent in New Zealand, I took only 63 pictures. Photography just isn't my thing. Fortunately, photography is a thing for other people. 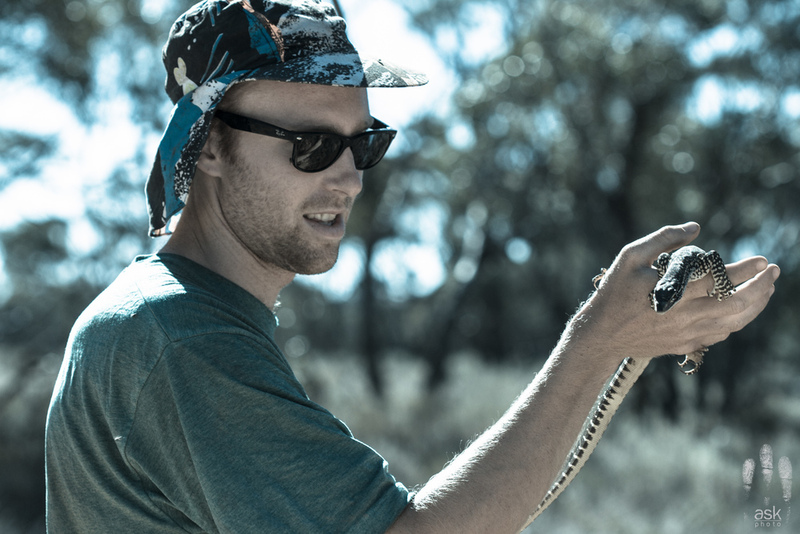 On my PhD field trips in Australia I bring plenty of volunteers to help catch lizards and thankfully most of them bring their cameras. Before we leave, I make it clear that I would like them to "donate" their pictures to me. That way I can have all the memories without actually having to take the pictures myself. And what use is it for everyone to stand next to each other and all take pictures of the same thing anyway? To me it makes a lot more sense for one person to take the picture and then share it. I know not everyone feels the same way, and I respect that. Lucky for me, all but one of my photography-inclined volunteers have shared their photos with me. It's these photos, taken by my volunteers, that I'll be sharing here. If a photo appears here then the person who took it gave me permission to use their photos publicly. Each photographer has specified how they want to be acknowledged. If a photo appears without accreditation, either the photographer has given me permission to share their pictures uncredited or the photo was one (begrudgingly) taken by me. Angus Kennedy with a thorny devil, Moloch horridus. Thurlga Station, South Australia, 2012. The lizard is a thorny devil (Moloch horridus), one of Australia's most unusual and iconic reptiles. It's not an easy creature to come across in the wild. The other exciting find is Gus's hat, which we found in the Alice Springs Salvation Army. The hat is as ridiculous as it is sun-safe, also not an easy thing to come across. As part of the website I now have a blog, this blog, that I think I will use mostly for posting pictures with a little more background information than is possible with the gallery. The best photos posted here will be cross-posted to the gallery as I put them up, with links coming back to the blog post they belong to.